After the box of chocolates has been emptied, the romantic dinner enjoyed, and the flowers begin to wilt, you kiss your partner goodnight and wait for next Valentine’s Day. Traditions are an important part of a healthy relationship and these gifts are a fine way to show and receive affection, but they are gone almost as soon as they are given. A nice pair of cufflinks or earrings will last longer, but while they put a smile on your partner’s face, your bank balance has taken a dip. Why not try something new this year? How about a priceless Valentine’s Day gift that lasts forever, keeps giving and giving, and will bring as much happiness to you as it does to the one you love? It’s called a letter of gratitude. Having gratitude––focusing your thoughts on the things you are thankful for, on what you love­­­––is powerful. Gratitude can put a spring in your step, uplift and energize you. Even if you’ve been feeling distant from your partner or have had relationship issues, gratitude will give you hope and inspire solutions. When you’re mindful of your gratitude, you’re focusing on the joy in your life big or small, your opportunities, and your abilities to create more abundance. The power of gratitude works magic on relationships. Your relationship suffers when you focus on the negative, while having gratitude for what your partner brings to your life makes your bond stronger and grows your fondness and adoration. This Valentine’s Day, give your significant other a gift that truly expresses your love: a heartfelt letter of gratitude. Take a quiet moment to think about your relationship. Spend a few minutes reminiscing about your partner, your life together, and what he or she means to you. Think about your partner’s strengths, virtues, and other admirable qualities. How have they benefited you? Write down a list of the qualities you appreciate most––generous, insightful, kind, funny––as well as the contributions the person has made to your life: Did he offer love and support during a difficult time in your life? Does she inspire you to achieve your goals? Maybe your partner taught you to see things more optimistically, to laugh more easily, and relax more often. Maybe they encouraged you to reconnect with old friends or helped you address long simmering family problems. Think about what you are grateful for and how your partner helped to positively shape who you are today. 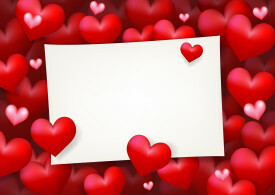 Now write your partner a letter, expressing your gratitude. There is no right way to do this––just open your heart and share your thoughts and feelings. Try to relax, have fun, and enjoy the loving energy that is flowing as you express your gratitude to your significant other. When you’re done, fold up the letter, put it in a nice envelope, and give it to your partner. After Valentine’s Day, remember that gratitude shouldn’t be exclusive to official days celebrating love. It may sound odd––and impossible––but the best time to cultivate gratitude is when you’re not feeling it. If you’re not feeling great about your self, your life, or your partner, practicing gratitude could actually save your relationship. Although gratitude is simple, it isn’t always easy. You can’t wait for feelings of love and gratitude to spontaneously wash over you, instead you have to practice being mindful of what you have to be grateful for. To build your gratitude muscle and make it a habit that you can rely on when things are tough, you’ll need to practice a little bit every day. With your cup of coffee or tea in the morning, write in a small notebook a list of the things that you are grateful for in your relationship and appreciate about your partner. If you can, add to this list throughout the day. Before going to sleep at night, review the day’s list. By cultivating gratitude, you’ll become more conscious of the good in your life and focused on the positives. You’ll soon be able to bring this new uplifted energy into your relationship. Gratitude empowers you with joy that can be expressed this Valentine’s Day, next Valentine’s Day, and every day in between.